Love the hypnotic effect of this hexagon medallion quilt, c. 1870 from the Starley Antique Collection. Closer look at the Madder Brown fabrics alternating with shirting fabrics. *Remember to click on photos to enlarge and see more details. 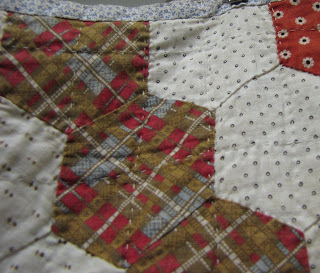 One of my favorite things about this quilting is the simple and yet creative hand quilting pattern. The maker used a simple overall grid pattern. A much easier pattern than quilting around each hexagon by hand and it would be a super way to quickly machine quilt a hexagon design. The full quilt - so striking and graphic!